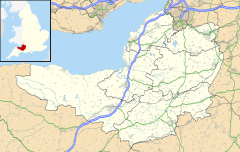 Coleford is a village and civil parish in Somerset, England, situated on the Mells River in the Mendip Hills five miles west of Frome. The parish has a population of 2,313 in 2011. Coleford was listed in the Domesday Book of 1086 as Colford, meaning the hill ford, possibly from the Old French col and ford, or alternatively the coal ford, a ford over which charcoal was carried. There are visible remains of a famous unfinished engineering project, the Dorset and Somerset Canal aqueduct, known locally as the 'Huckyduck', which was abandoned in 1803. The village once had several coal mines as part of the now closed Somerset coalfield. Just north of Coleford there were the collieries of Newbury and Mackintosh. Mackintosh opened in 1867 but closed in 1919, due to flooding. The Natural Stone Products factory is built on the site of Newbury Colliery. This pit started around the beginning of the 19th century and closed in 1927. The Coal Barton mine was the scene of a firedamp explosion which killed nine miners in 1869. The village falls within the Non-metropolitan district of Mendip, which was formed on 1 April 1974 under the Local Government Act 1972, having previously been part of Frome Rural District, which is responsible for local planning and building control, local roads, council housing, environmental health, markets and fairs, refuse collection and recycling, cemeteries and crematoria, leisure services, parks, and tourism. The village falls within the 'Coleford and Holcombe' electoral Ward. The ward stretches in the east from Coleford before going west to Holcombe and then south west to Stoke St. Michael. Mells is also included. The total ward population as at the 2011 census was 4,700. The Anglican Parish Church of The Holy Trinity was built in 1831 by J. Sperring. The Methodist Chapel is a little more recent having been built in 1865. ^ a b "Coleford Parish". Neighbourhood Statistics. Office for National Statistics. Retrieved 1 January 2014. ^ Robinson, Stephen (1992). Somerset Place Names. Wimborne, Dorset: The Dovecote Press Ltd. ISBN 1-874336-03-2. ^ Atthill, Robin (1976). Mendip: A new study. Newton Abbot, Devon: David & Charles. ISBN 0-7153-7297-1. ^ Dunning, Robert (1983). A History of Somerset. Chichester: Phillimore & Co. ISBN 0-85033-461-6. ^ a b c "Coal Mining". Somerset Ramblers. Archived from the original on 25 October 2009. Retrieved 12 November 2006. ^ "Frome RD". A vision of Britain Through Time. University of Portsmouth. Retrieved 4 January 2014. ^ "Coleford and Holcombe ward 2011". Retrieved 7 March 2015. ^ "Church of The Holy Trinity". Images of England. English Heritage. Retrieved 30 November 2008. ^ "Methodist Chapel". Images of England. English Heritage. Retrieved 30 November 2008. This page was last edited on 11 October 2018, at 20:15 (UTC).